Last year, the Red Bull Indianapolis GP was named the best round of the championship by MotoGP, and that's mostly due to the experienced professionalism of the Indianapolis Motor Speedway staff. But the enthusiastic welcome the city always gives to race fans is another big draw, and a popular part of that welcome is the Motorcycles on Meridian event. Looking south on Meridian Street from Monument Circle: motorcycles farther than the eye can see. Photo by Lance Oliver. Ready to ride. Photo by Lance Oliver. Motorcycles on Meridian has been a part of the MotoGP weekend from the beginning. Meridian is the main north-south street through the heart of downtown Indianapolis and a portion of it from Monument Circle south is closed to all traffic except motorcycles and pedestrians. It keeps getting bigger and bigger, and what started out as a Saturday night event now fills downtown both Friday and Saturday evenings. 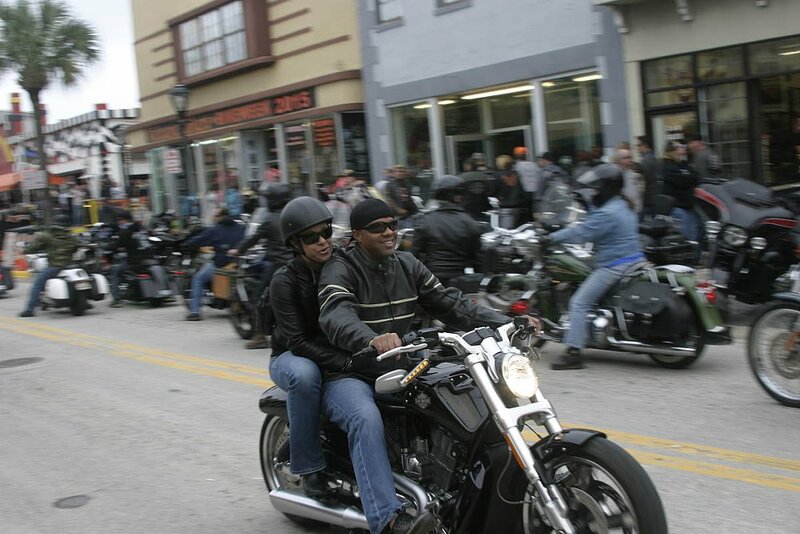 This year, it burst the seams and I had to park two blocks beyond the closed section of Meridian, which was fully lined, both sides and in the middle, with thousands of parked motorcycles. Even people who don't ride come out to see the free show. Somebody also rode a new Kawasaki H2 to Motorcycles on Meridian. Photo by Lance Oliver. The scene is as eclectic as it is electric. Indianapolis is the middle of the Midwest, so naturally there are lots of Harleys. But this is also race weekend in a racing town, so you'll also see a wide range of go-fast motorcycles, both stock and customized, old and new, and maybe a few rarities. I saw both a 1970s Kawasaki H2 and a brand new one right out of the factory. Two versions of fast, 40 years apart. What's your preference: "Low N Slow" or FasteRR? Photo by Lance Oliver. Where else will you see a Bimota parked beside a Harley-Davidson with green accent lighting? Everyone is welcome at Motorcycles on Meridian. Photo by Lance Oliver. This leads to my favorite activity at Motorcycles on Meridian: taking photos of bikes parked next to each other that you would never normally expect to see in the same place at the same time, such as a Bimota next to a Harley with LED accent lights, or a pair of customized Groms next to a matte-black Sportster and across from a stretched Hayabusa. "That's my wife's bike," explained the burly ABATE volunteer working security for the event. Nice pigtail. Photo by Lance Oliver. Despite a bigger than average crowd at the weekend races, and a bigger than ever Motorcycles on Meridian event, there are rumors that 2015 will be the last year MotoGP comes to Indy. That would be unfortunate. The racing and the downtown gathering feed each other. I parked next to two women riders on cruisers who weren't about to miss the downtown party. But they also planned to go to the MotoGP race the next day, the first time they'd ever gone to the races. Personally, I hope these photos don't capture the farewell tour for Motorcycles on Meridian.